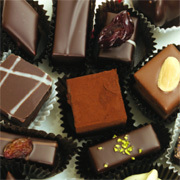 L.A. Burdick Chocolates are known for making quality hand-made chocolate creations. These chocolates are not similar to those that you might buy from supermarkets or shops which usually contain more sugar than chocolate. L.A. Burdick chocolates are actually what experts might call as true chocolate creations. It is something of a rarity in US shores once upon a time. L.A. Burdick first started when Larry Burdick first came back from Switzerland with a dream to make real quality chocolates in the US and not just the usual sugary stuff made available anywhere. Armed with this idea, Larry went on to create chocolate in the way that they should be made- with pure chocolate. He used dark chocolates from France and Switzerland which are known to have the richest flavors but were not that known in the US then. From then on, Larry Burdick became known as one of the pioneers in making high end gourmet chocolate in the US. L.A. Burdick is most known for its delicious chocolate bonbons and has started branching out to other chocolate derived products since then. The chocolate maker has since received several awards for its chocolate creations and is still considered as one of the best in the US when it comes to gourmet chocolate.